Recessed heavy duty 1/8-inch construction with 1/8-inch door. Protected by dual jagged teeth "anti-fish baffles"
Please Note: Front Load Depository Safes are not meant for overnight storage. 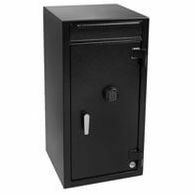 These safes are a deterrent during a holdup and keep employees honest. An essential item for any business. It's time to go to the bank, you go into your cash register and find that your cash is $100 short for the third day in a row. You ask your employee where the cash is and they stare at you with a blank face. Unfortunately, employee theft and shrinkage is a fact of life. In today's competitive marketplace every dollar counts, don't let yourself become a victim of this harsh reality. 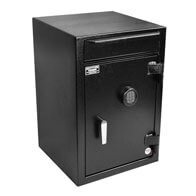 Constructed of solid steel, this drop safe is a real safe, not the cheap, thinly constructed versions you see littered over the internet. 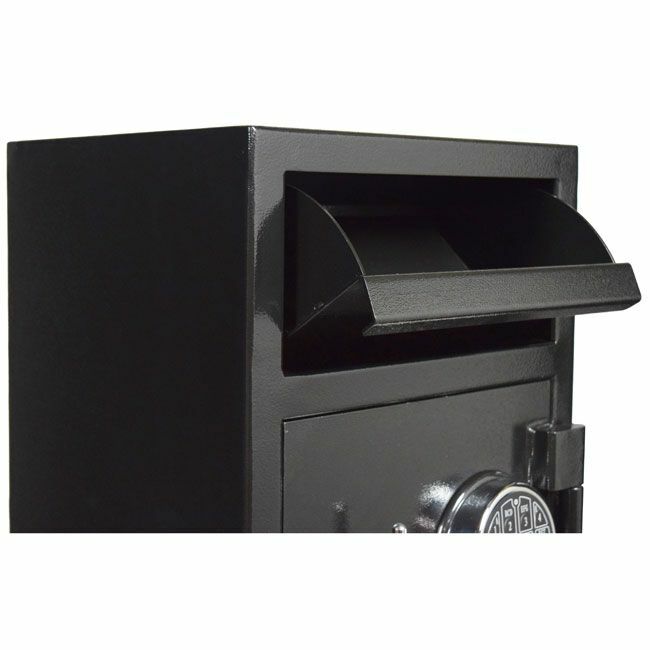 Ideal for gas stations, restaurants, hotels, motels or any retail business handling cash, receipts and items of value, this sturdy depository safe will watch your valuables closer than your mom would. Weighing a whopping 90 pounds you'll notice its heavier than its nearest competitors. 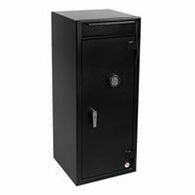 That's because there's a significant amount of steel in this safe which adds considerable strength against a forced entry attempt such as a pry attack. 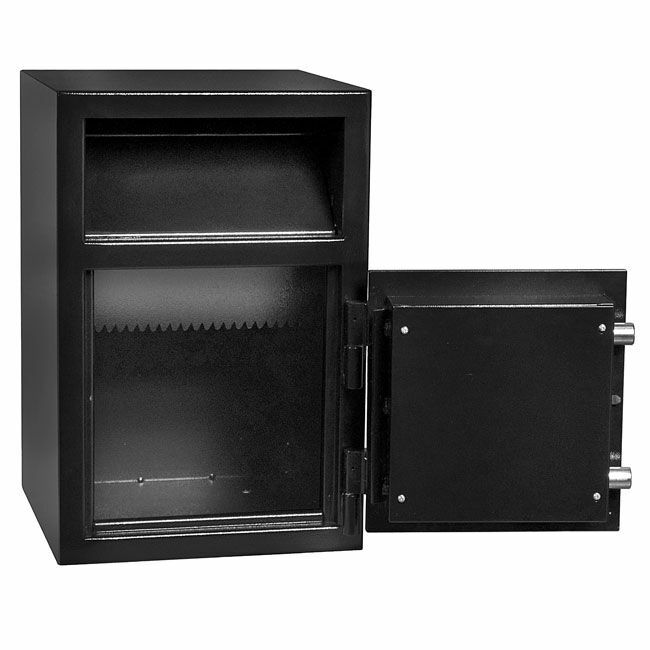 Unique to the Stealth Drop safe is a recessed deposit door and because it sits back it makes a fishing attack near impossible where a thief will take a fishing line with a hook and attempt to pull out the cash through the top door. At the back of the drop door, you'll find jagged teeth, anti-fish baffles that will prevent any paperwork or cash from being removed. On the front of the 1/2" solid steel door lies a high quality UL Approved Electronic Lock named the Intellock. It's been tested for EMP attacks and successfully passed, check out the video of the test in the "video" tab. 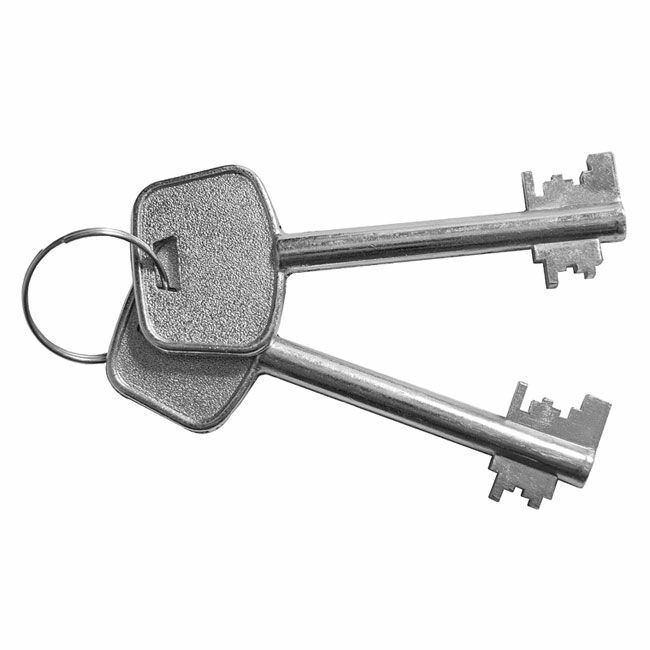 This lock will perform reliably for years and years and has the same approval and security rating as the Electronic locks you'll find on the top Gun and Home Safes from companies like American Security, Liberty, Cannon and Fort Knox. Protecting the lock is a relocker that will fire the bolts during a drill attack preventing entry and ensuring your valuables are safe. Stealth has now added a key override behind the keypad that will ensure access to your safe no matter the situation. Just inside the door, you'll see an auto-detent system that locks two 1" solid steel bolts automatically for you when the door closes. 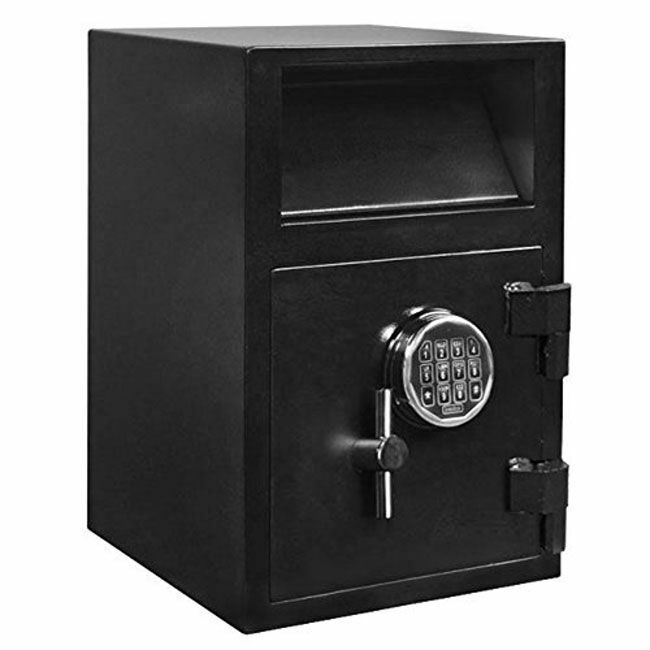 You'll never have to worry about making sure it is fully locked, the safe does it for you. 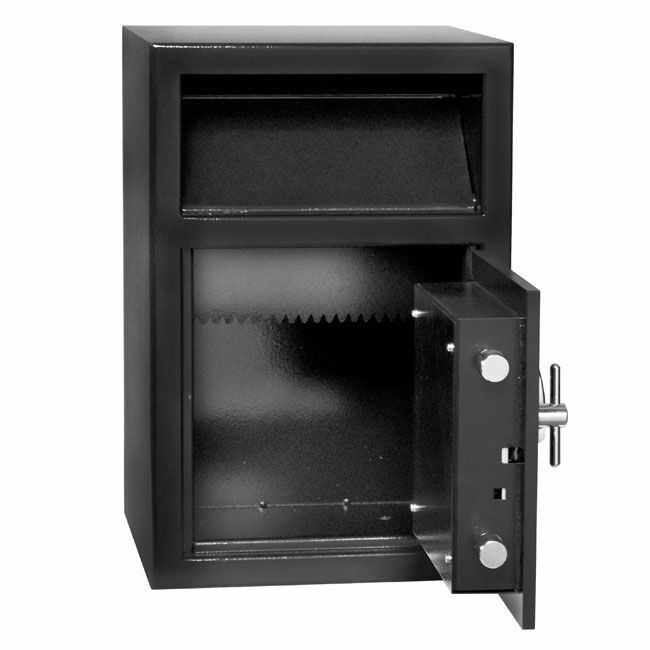 On the bottom of the safe are 4 bolt down holes that will allow you to secure the safe and prevent a burglar from just picking it up and opening it on their own time. 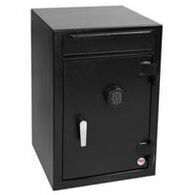 Stealth believes in and stands behind the DSF2114 Drop Safe by offering a one year warranty. Broad Form & Mercantile Insurance Classification, Built to exceed the classification for a "B" Rated Burglary Safe. If you're looking for a top quality Drop Safe at an extremely affordable price, you've just found your perfect safe, the Stealth Drop Safe!